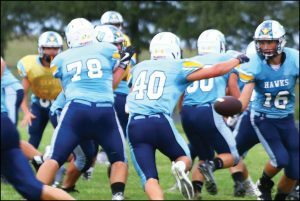 The last time the Lynnville-Sully football team suited up for a game, it was for a state quarterfinal appearance in the 2015 season. After an 8-4 season and graduating seven seniors, including key running back Sage Ehresman, the Hawks enter the 2016 campaign looking to pave a new path to success. 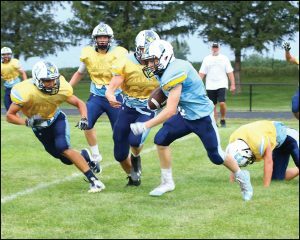 The annual Gatorade scrimmage last Friday helped to prep the team for the official football season, which kicks off this Friday, Aug. 26, at home versus Colfax-Mingo at 7 p.m. L-S Coach Mike Parkinson, who returns at the helm for his sixth year as head coach, participated in the Q-and-A interview below. When did practices start? How has the team looked so far? We started practice on Aug. 8. We've battled a lot of heat and humidity, but we've had a strong start in the first two weeks. Our guys have worked hard through tough conditioning and changes we've made. We've had the National Guard lead some military training, gone swimming in Grinnell as a team, fundraised a record amount, and have competed for playing time each day. What strengths do you see in your team? How about areas to improve? We have a lot of depth at many different positions on offense and defense, and our overall team speed is good. Our leadership has been great so far from our older athletes, and we've had younger players really step up. With that being said, we are young in a lot of areas, and we'll need some game experience to really get going. Who will you be looking to as leaders on the team? We've started a new leadership program this year called "Five Units Strong." Each unit has a senior leader who takes on a lot of responsibilities leading his unit, much like a unit leader would in a military setting. Dylan Roozeboom, Trevor Squires, Ryan Hofer, Caden Dunsbergen, and Tyler Van Zante are our senior unit leaders and in-season captains. Who do you think will be some of the stronger teams in the schedule this year? We believe we will have a strong team this year, and other teams who return a lot from last year are Montezuma and Pekin. There might be some surprises this year; there are four new coaches in our district. We know our rivals of BGM, North Mahaska, and Montezuma will always give us a great run for our money. Has the team set any goals for the year? 3. Be relentless in everything we do. 4. Live with integrity. If we can accomplish those goals, we will be a pretty tough team to beat.